Before the 1990s, there was no question about it: French butter reigned victorious in just about every pastry kitchen of worth. Its complex, nutty flavor with a slightly tangy back note, superior plasticity, and sterling pedigree were world famous. French chefs, accustomed to working with such an excellent ingredient in their homeland, had long ago convinced a cadre of important American colleagues to follow suit. And, therefore, French butter’s preeminence remained unchallenged. But over the past decade, new American butters have been storming the palace gates. The result? American butter is now being layered into mille-feuille or smoothed into rich pastry creams as often as some of the most revered French beurre brands. To understand the once-wholesale dismissal of American butter by many chefs requires a look back at two of the great watershed events in this country’s history: the world wars. According to Jonathan White, artisanal cheese maker and owner of Bobolink Dairy in Vernon, NJ, there was no such thing as 80 percent sweet-cream butter — the product today’s chefs find bland and watery — before the advent of refrigeration and industrialization. “Because of smaller-scale production, butter was churned every second or third day, so the room-temperature cream had time to sour, or ferment,” he says. It was this cream, in essence crème fraîche, that was churned into a richer, more complex-tasting butter — the kind many of the best French dairies were producing. In the United States, the wars put an end to this process by drafting many of the young farmers and encouraging large companies to industrialize the dairy industry, in an effort to manufacture rations for troops and products for foreign-relief efforts. With the introduction of the continuous butter maker, it was possible to pour uncultured cream into one end and, minutes later, get butter with a consistent 20 percent water content out the other. The technology helped win the wars but killed the spirit of American butter. So what has prompted highly regarded chefs — such as François Payard, owner of Payard Patisserie and Bistro, and Eric Bertoïa, executive pastry chef at Daniel, both in New York City, as well as Gregory Gourreau, executive pastry chef at Le Cirque in Las Vegas — to open their larders to American butters? In part, the reemergence of small, artisanal dairies. Says Allison Hooper, co-founder of the Vermont Butter & Cheese Company in Websterville, VT, “We looked around and saw that in order to make a niche for ourselves, we had to raise the butter bar.” She has done that by producing a cultured butter with an 86 percent butterfat content. Hooper’s company, along with other small producers, such as Ronnybrook Farm Dairy in Ancramdale, NY, and the Straus Family Creamery in Marshall, CA, was among the first to fill a nearly 90-year void. Nearly every chef who was interviewed echoed his sentiment. Most agree they would reach for a French brand when an intense buttery taste was paramount, in a sablé Breton or a particularly delicate lemon curd, for example. But, for the most part, they prefer American butter for making items such as almond creams, ganaches and other fillings. Some, though, turn to American brands for the true test of a butter’s mettle: mille-feuille. Because of the history and consistency of the production of these exclusive butters, nearly all of them fall under the designation of Appellation D’Origine Contrôlée (AOC). At the moment only a handful of areas in France, which include Charentes-Poitou and Normandy, produce AOC butter. The AOC requires that each butter’s character be rooted in a limited geographic domain. So the pastures where the cows graze, the feed they are given, and even the local springwater the farmers wash the butter with are carefully monitored. “It’s the quality of the land that makes French butter so good,” Bertoïa says. And it’s this inalienable French concept of terroir that many chefs, both French and American, use to draw a line in the sand. Often, though, taste takes a backseat to cost. By definition AOC-butter production is small scale. “The [Échiré] cooperative produces 950 tons of butter each year, just 0.2 percent of all the butter produced in France annually,” wrote journalist and author Dorie Greenspan in a New York Times article last year. This limited supply creates a seller’s market, which ratchets up the butter’s price. “Butter is like Wall Street,” says Payard. “Prices go up and down. Sometimes if I get a good price, I’ll lock it in.” According to Hermé, some chefs even engage in butter speculation, hoping to get the best possible price. 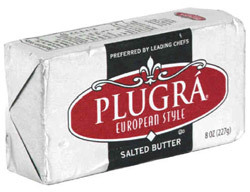 One solution they’ve found for keeping costs down, while sacrificing little or no quality, is adding commercial American butters, such Plugrá or Beuremont, to their inventory. Surprisingly, it’s not just French butter that can burn a hole in a chef’s wallet. American butter has on occasion edged out its French rival when it comes to price. “Sometimes you’re better off buying French butter,” remarks Payard. “Two summers ago the price of American butter went sky high. Why? Because all the cream was being used for ice cream.” Instead, he ordered French butter at a lower price than he could get for domestic brands. In the end, the 90-year-old stronghold that French butter has had over pastry kitchens seems to be loosening. Many chefs are accepting what American artisanal dairies have to offer, oftentimes collaborating with them to produce a meticulously cultured butter that, because of its American terroir, can rival some of France’s best. 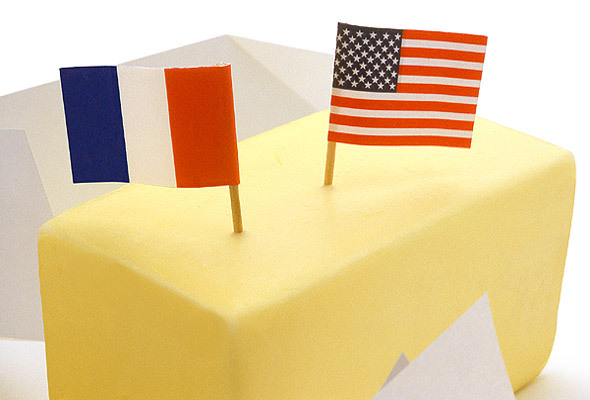 And ironically, French butter’s continued allure and status are assured by the addition of high-quality, less-expensive commercial American brands. This culinary détente, unimaginable just 12 years ago, is helping chefs turn out products of superb quality, consistently and economically. Photo © 2003 George Jardine. All Rights reserved.